Has Chevrolet Cracked Code to Small Car Sales Success with the Cruze? The Vega was Chevrolet’s first go at responding to the Japanese. The rise of the compact car in the American market began with the German (through Volkswagen) and Japanese (Toyota and Datsun) invasions. They didn’t seem like a danger to domestic automakers at the time. Their cars were small, even tiny. And why would they be considered a danger? In 1960 the big three (Chrysler, Ford and GM) and American Motors Corporation controlled a whopping 93 percent of the market in North America. These same companies also held nearly half of the global market, with 48 percent of all sales worldwide. Fast forward to today, and you’ll see plenty of small cars on the roads. Millions of Toyota Corollas and Honda Civics. Ford Focuses seem to be almost everywhere. 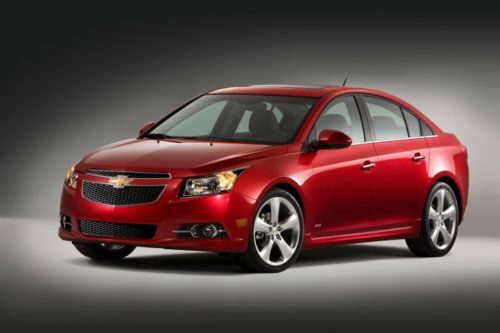 And as of late, there are plenty Chevrolet Cruzes roaming those roads as well. The Cruze has been an unabashed success for General Motors. In its first full year of sales, it’s already broken into the top 10 in the United States, with more than 211,000 sold through September, 2011. We know what you’re thinking. Yes, the Cruze has benefited from production slowdowns in manufacturing that have plagued stalwarts Toyota and Honda. That’s the only reason why it’s sitting in the top 10, and that’ll change once the Japanese automakers recover production. And it might be easy to dismiss the car as just that – an sales aberration caused by natural disasters that decimated competitors supplies and inventory levels. But consider this. The United States has contributed less than a quarter of the Cruze’s total worldwide sales, which broke one million just as Chevrolet was celebrating it’s 100th birthday this week. But less than a quarter of the total sales – they broke one million right as Chevrolet is celebrating its 100th birthday – worldwide, it’s obvious that it’s not simply a hit stateside. Think about Chevrolet’s experience in the subcompact market. Initially pioneered in the U.S. market by Datsun, Toyota and Volkswagen, domestic automaker didn’t get into the swing of things until 1970. In ’70, American Motors Corporation (AMC), Ford and Chevrolet both began selling their own subcompact cars, with the AMC Gremlin appearing first, and six months later the Chevrolet Vega beat the Ford Pinto to market by just a single day. And despite the poor workmanship and shoddy quality that plagued the Vega, Chevrolet kept it up through the years, with models like the Chevette, Cavalier and Colbalt each picking up the mantle where the last one left off. In its first full year, the Cruze surpassed the Cobalt’s performance in its very best year of sales, topping them by 2,000 units a month. But that’s just the U.S. market. Worldwide, there’s almost no comparison. We believe this is the best small car General Motors has ever offered in the United States. It’s a competitive offering that isn’t behind competitors. There’s a version that offers 42 mpg – right with the best Asian automakers offer. So on that account, Chevrolet and GM seem to have finally found the magic formula. But the competition is going to continue. Ford’s new Focus is an extremely compelling offering. Honda and Toyota will recover. Korea’s Hyundai and Kia tandem are hitting home run after home run.